Is a bear invasion in Lake Tahoe's near future? Drought conditions in the Lake Tahoe area could mean more bear encounters. Scroll down to the bottom of this page to watch the recorded-live news video. LAKE TAHOE, Calif. — If you listen to veteran Bear League director Ann Bryant, you might want to start taking some serious precautions if you have a place in the Tahoe area. "We are expecting not only the town bears around Tahoe, but the backwoods bears to start heading in this summer, in record numbers," Bryant said. 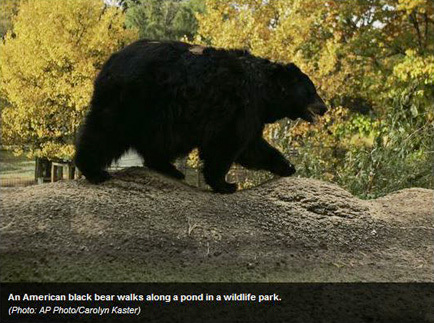 The reason: four years of drought have taken their toll on the bears' natural food source. Bryant said she's seeing a warm and relatively snow-free spring that is bringing bears out of hibernation early. "They're out, they're about, they're looking for food everywhere," Bryant said. "And, they have never been all out this early before." With their keen sense of smell, bears can find anything from open garbage to dog food, even if it's inside a garage or home. "If it's right on the other side of a garage door, they're gonna smell that and they're gonna try to rip the garage door off of it's hinges to get to that dog food," California Department of Fish and Wildlife Capt. Patrick Foy said. "Prevent attracting them in the first place -- securing all sources of food, especially garbage." Bryant is even urging people in the Tahoe area to spend the money to electrify doors and windows. "And if a bear comes up to it to snoop around that window or door, he'll zap his nose and he'll run off," Bryant said. Getting a electric system can cost around $1,000. "It's way less expensive than probably replacing one or two windows," Bryant explained. Bryant expects to see record number of bear-human contacts in the Tahoe basin this summer. "They've evolved around us long enough now to realize that we have food in our homes," Bryant said. "They need it and they want it and they're gonna get it if they can."